The first official geography of the Ming dynasty was the Huanyu tongzhi 寰宇通志, a name which is partly derived from the official geography of the Northern Song upon which it was modelled, the Taiping huanyu ji 太平寰宇記. However, shortly after its completion it found disfavour with the Emperor Yingzong 英宗, who commissioned a new geography to be modelled on that of the Yuan, the Dayuan dayitong zhi 大元大一統志 (“Great survey of the Great Yuan empire”) which had been compiled in the late 13th and early 14th century (and of which only a relatively small proportion is extant). Like the earlier history, its title Daming yitong zhi 大明一統志 reflected that of the work upon which it was modelled. It was completed in the fourth month of 1461 (天顺五年), and printed in the palace. The statesman and political operator Li Xian 李賢 heads the list of compilers, something which is due more to his status than the role he played in its production. 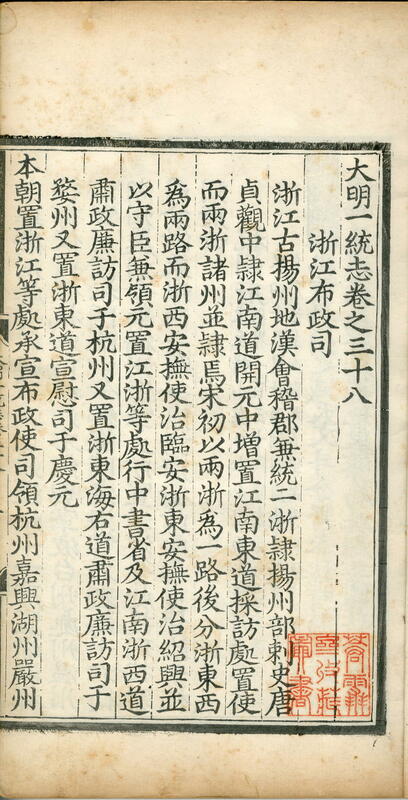 This is not an early printing, but is nevertheless a most impressive example of Ming imperial book production, and the fascicles bear their original printed labels. The fascicles are disposed in eight han 函. 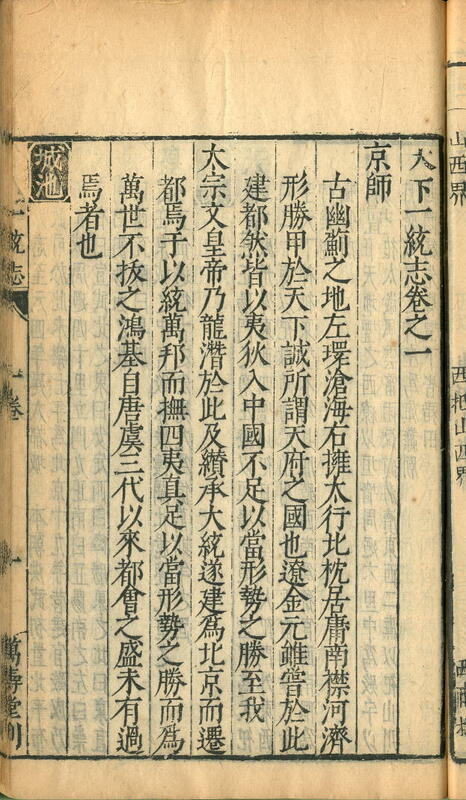 Curiously, the single owner’s seal in the edition has only been applied from the first fascicle in the fifth han, that is, only starting half-way through the book. 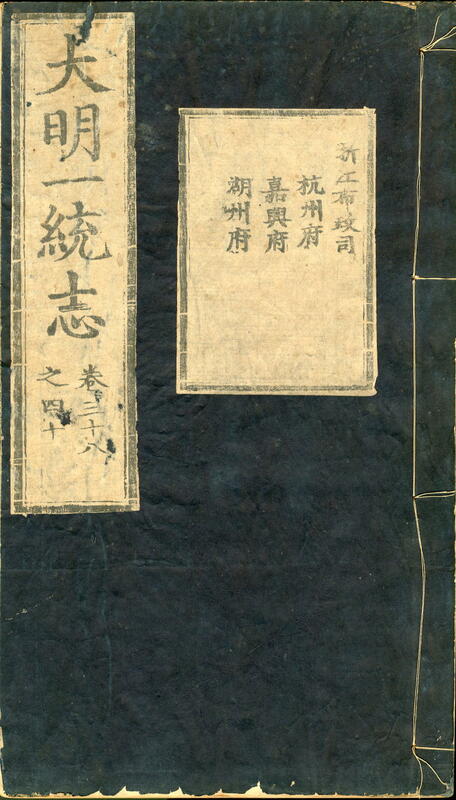 Like all editions of this date, it was originally bound in “wrapped-back” style (baobeizhuang 包背裝), and traces remain of the paper that was originally pasted on to the back edge of the fascicles. No cataloguer seems to have determined precisely when the blocks were originally cut, but the assumption is that it was during the Wanli period (which is sufficiently long to make such an assumption fairly safe), sometime either side of the year 1600. 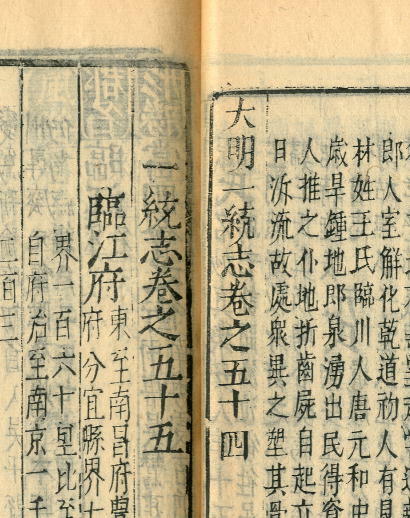 The publisher’s name 「萬壽堂」 appears in the lower banxin 版心 of each leaf, and is otherwise unknown. When I first catalogued this edition in the early 1980s, I thought it was rather rare. Since then, first comprehensive printed union catalogues and now the internet have shown that it is in fact very common, but that does not diminish its interest. I thought it was rare because at that time, I could not find the title 「天下一統志」 in any catalogue then available to me, so began to study the edition in some detail, and examined every single leaf. This soon gave the game away – it always does! 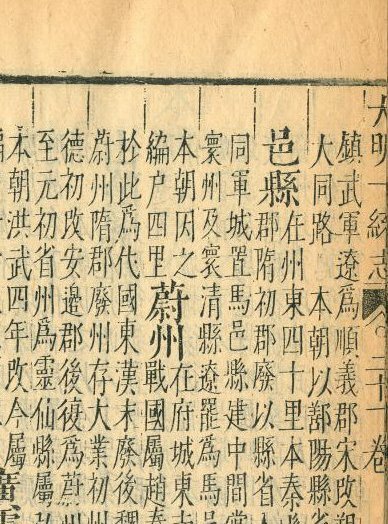 The edition may well have been cut in the Ming, but this copy was printed in the Qing, as the doctoring of the blocks makes clear. The publisher could hardly sell a survey of the “Great Ming” dynasty once the “Great Qing” had taken over, yet he was unwilling to lose his considerable investment in the printing blocks. So he excised the words “Great Ming” 「大明」 wherever they appeared, that is, in all the prefatory material, at the beginning and end of each juan 卷, and in the lower central column of each block 版心下. In the prefatory material and at the beginning of the first juan only, he inlaid a new piece of wood and carved the two characters tianxia 「天下」, so that the title of the book now became a “Survey of the whole empire”. The other chapter beginnings and endings simply read “Survey” 「一統志」. 19:36; 21:2; 23:34; 25:18,24; 26:7; 28:29,30,46; 29:45,46; 31:15,16,22; 33:13; 34:35; 35:33,35,36; 46:5; 47:2; 51:2; 53:2,13; 58:2; 72:10,29; 77:2; 88:13. I wonder if all the Qing printings of this work (and many are extant) retain the original title in these places, or whether upon discovery they were later excised from the blocks in their entirety.